The Alaska Airlines Visa Signature Credit Card currently has an Informr score of 7.8 out of 10. This score is based on our evaluation of 11 sources including reviews from users and the web's most trusted critics. Alaska Airlines Visa Signature Credit Card is typically available to those with good credit scores (650 or greater). Think of this as the tasting menu of airline cards - and everything is toothsome. You receive an annual companion ticket, excellent earnings rate on airline spending, and the ability to book flights on partner airlines (including American Airlines) with your miles. Yum. The Alaska Airlines Visa Signature® credit card isn’t a good deal if the airline doesn’t cover the routes you travel most. But if Alaska is your go-to airline, this is one of the most valuable mass-market airline cards available, and well worth the annual fee. Get Alaska’s Famous Companion Fare from $121 ($99 plus taxes and fees from $22) every year on your account anniversary valid on all Alaska flights booked on alaskaair.com with no blackout dates. There are plenty of good travel cards out there. However, few are attached to a program as flexible and easy-to-navigate as the Mileage Plan. With Alaska Airlines' continued expansion and depth of travel partners, it isn't difficult to maximize value using the credit card. If you fly with Alaska regularly or are an airline free agent near an airport with frequent Alaska Airlines routes, this card is definitely worth a deeper look. Between its Coach Companion Fare Certificate and miles-earning-potential, the Alaska Airlines credit card is a travel-hacker favorite. There is a lot of value that can be mined out of it, for those who travel with Alaska Airlines, or its partners, at least once a year. Cardholders will need to be careful when redeeming their miles if they want to maximize value. Thanks to a decent earning rate for Alaska Airlines purchases and the valuable companion ticket you can use once a year, the Alaska Airlines Visa Signature can be a great choice. 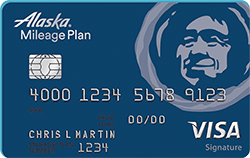 The Alaska Airlines Visa Signature Card comes from Bank of America’s series of travel credit cards. If you frequently fly Alaska and Virgin America, it offers 3x miles for purchases on these airlines coupled with travel perks that sweeten the deal. It’s best suited to be a complementary card, used only for Alaska Airlines expenses to supplement an everyday card with more well-rounded rewards.